Most of the new 200 Series models feature New Holland’s patented vertical lift Super Boom® design, which delivers best-in-class forward dump height and reach. It is thus easier than ever to load materials efficiently right to the centre of the truck. The industry leading bucket breakout force and dump angle provide fast cycle times and dramatically increase productivity. There are tens of attachments available for these multi-tasking masters, and they are very easy and fast to change thanks to the Connect Under Pressure feature. Operators have full control of the attachment at their fingertips, with proportional hydraulic controls on the joystick, together with the attachment electronic controls. The unparalleled stability granted by the longest wheelbase in the industry and the low centre of gravity ensure both the highest safety standards and unprecedented productivity. Boosting overall productivity are also the Glide Ride option, that eliminates arm bouncing while moving, and a new self-levelling bucket. The 200 Series models offer the widest and most comfortable cab in the industry, with plenty of head and foot room. The side screen protections have been redesigned to improve further lateral visibility from the cab. Together with the compact design of the new arm, this redesign provides unequalled visibility in critical zones. A host of new features, such as keyless start and the available heated or air-ride seat, add to the operator’s comfort. 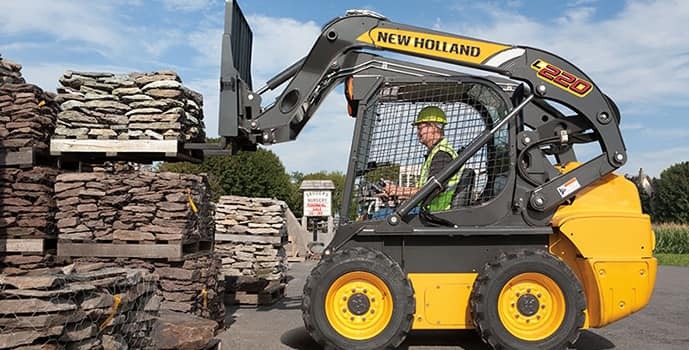 The new 200 Series provides the operators with a comfortable workspace and outstanding all-round visibility in all applications, enabling them to work with confidence and get more work done.